If you’re looking to repair, install or troubleshoot your original Toyota Land Cruiser FJ40, FJ45, or FJ55 AM Radio, below is a document you can either print out or view online that provides directions for any Panasonic, Fujitsu 10 (Ten Audio), or Matsushita radio. The manual says it’s for a Toyota Carina, but we’re almost positive this is the exact same radio that goes in an FJ40. TIP: use the “full screen” button in the bottom right corner for better viewing and printing. 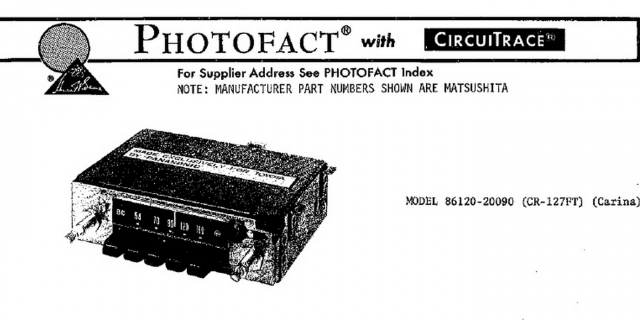 Photofact With Circuitrace – Toyota Model 86120-20090 – Includes parts list and description.